Esco VIVA Universal Workstation draws on Esco's experience of over 25 years in laminar air flow technology. The enclosure employs two independently balanced ULPA filtration modules to protect animals inside the enclosure from exposure to airborne particulates/ambient contamination, as well as, the operator from exposure to allergens and other potentially hazardous materials. It employs an airflow recirculating design similar to a Class II Type A2 biosafety cabinet (operating principles described below). Featuring an ergonomically sloped front design and integrated carbon filters to remove odors emitted, the VIVA Universal Workstation ensures the comfort of the operator during operations. Coupled with the standard protective features of precise airflow engineering, ULPA filtration techniques, Esco Sentinel™ Microprocessor control and Isocide™ antimicrobial powder coating , the VIVA Universal Workstation represents a complete solution to your need for ergonomics, reinforced safety and operations efficiency in animal handling operations. 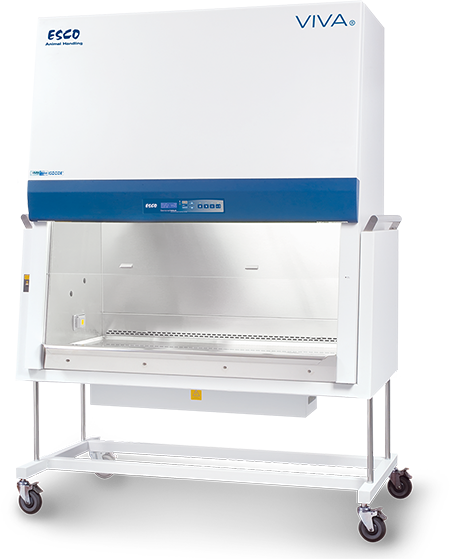 Operator, Product and Environmental Protection via controlled inflow, downflow and exhaust similar to Class II Type A2 biosafety cabinet technology (described in detail below). ISO Class 3 air cleanliness within workzone as per ISO 14644.1 (equivalent to Class 1 as per the US Federal Standard 209E, 100 times cleaner than the usual Class 100 classification on cabinets offered by the competition). Disposable high-quality polyester pre-filter with 85% arrestance located under the work tray removes large contaminants and particles. Minipleat separatorless ULPA filter technology , operating at the typical efficiency of 99.999% at MPPS, 0.3 and 0.12 microns provides better operator, product and environmental protection than conventional HEPA filters. This cabinet employs 2 ULPA filters, 1 for downflow and 1 for exhaust airflow filtration. Esco Sentinel™ Microprocessor allows the operator to easily access and control all cabinet functions on the LCD screen. Audible and visual alarms alert the operator to unsafe sash position and low airflow (detected by our proprietary airflow sensing technology). Fail-safe system ensures that in case of airflow failure, the cabinet automatically shuts down to ensure safety to the operator and the environment. Esco Isocide™ antimicrobial powder coating prevents surface bacterial growth and enhances operator safety.